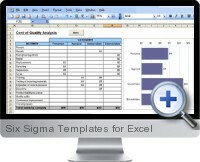 Six Sigma Templates for Excel are a focused collection of Excel templates for six sigma and statistical quality management purposes. A template menu is provided to allow the creation of a six sigma or quality control analysis and chart that automatically calculates with input data or data linked from other sources. X-bar and R Chart - for monitoring and analyzing data collected at regular intervals from business and industrial processes. X-bar and Chart - for measuring multiple observations and outcomes on an interval scale. Individual and Moving Charts - for monitoring variable data from business and manufacturing processes where impractical to use rational subgroups. c-Chart - for monitoring the number of nonconforming attributes per unit total number of events occurring during a period of time. u-Chart - for monitoring the average number of nonconforming attributes in process data where the sample size is greater than one unit. p-Chart - for monitoring proportions of nonconforming units in samples as a ratio to total sample size. np-Chart - for monitoring the number of nonconforming units in a process based on real numbers of units as opposed to a proportion. Histogram Chart - for visualizing the distribution of data in processes. Pareto Chart - for combining individual values as bars in descending order and the cumulative total as a line. Radar Chart - for visualizing multivariate process data within a two-dimensional chart of three or more quantitative variables represented on axes starting from the same base point. Performance Gap Analysis Chart – for comparing actual performance with potential performance. Positioning Chart - for displaying the relationships among aspects of a process problem in terms of their relative position within a two dimensional scale. Scatter Chart - for creating a analyzing the spread and convergence of process data using Cartesian coordinates to display values for two variables. Benchmarking Chart - for monitoring aspects of process performance against standardized base values. Cost of Quality Analysis - for displaying a tree model detailing the cost of good quality (conformance) and the cost of poor quality (non-conformance). Force Field Analysis- for developing a framework to analyze factors and forces that influence a process. Baldrige Scorecard - for developing development of a strategy map and aligned balanced scorecard as a framework for process improvement. One page Dashboard Report - an executive summary report of six sigma metrics. SIPOC - for mapping the flow and relationships between suppliers, inputs, process, outputs and customers. House of Quality - for defining the relationships between customer requirements and the process capabilities. Fishbone Cause and Effect Diagram - for tracking causal diagrams to identify quality defect prevention and potential factors causing an overall effect in a process.